The Occupational Safety and Health Organization wants Missouri’s grain handling industry to be vigilant in stemming the tide of tragedies. 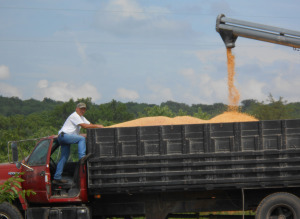 More than half of all workers “engulfed” in grain die in 60 seconds from suffocation. Since January, there have been two grain-handling deaths and four preventable incidents in Kansas and Nebraska. The Occupational Safety and Health Organization is currently investigating six grain industry fatalities and incidents. One involved a 42-year-old worker in Prosser, Nebraska, who suffered fatal injuries caused by an operating auger as he drew grain from a bin. In May of this year, a 53-year-old man working in West Point, Nebraska suffered severe injuries in a grain bin when a wall of corn product collapsed and engulfed him. OSHA says died of his injuries two days later. Grain handling plays an important role in agriculture, which is the number-one industry in Missouri. There have been no industry related deaths in Missouri in 2016.